If you shoot a video in one orientation but want to publish it in another, you need to turn it right-side up or upside down. In this article, I explain how to rotate your video online from your phone or computer. Videos are a powerful format, but GIFs are easier to share and embed in emails/documents. Creators often need to convert a memorable segment of an MP4 into a GIF. 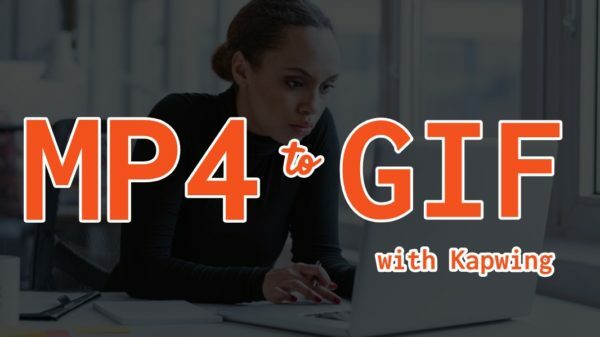 In this article, I’ll show you how to convert an MP4 to a GIF using a free online tool called Kapwing in four steps. You have pictures — JPEG or PNG files — and want to turn them into pictures, but how? 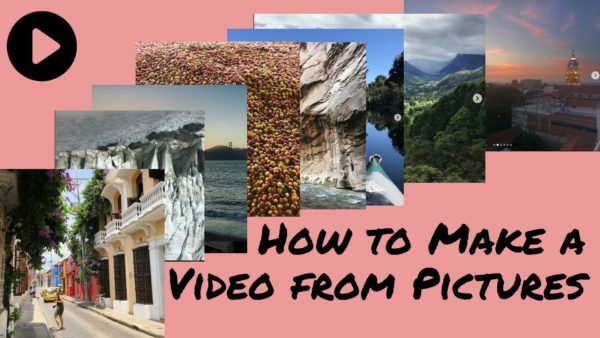 In this article, I’ll explain how to make a video from pictures online using a free video editor called Kapwing. 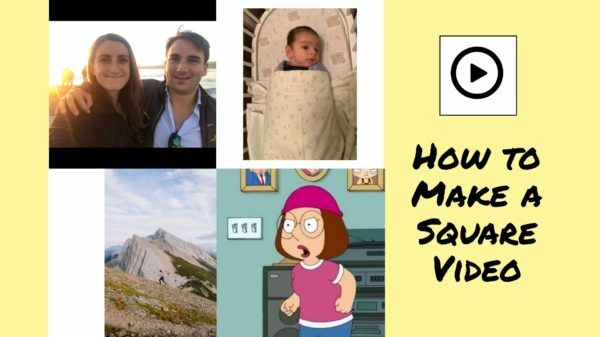 Square videos (those with a 1:1 aspect ratio) are the ideal size for social media platforms. Instagram, Twitter, LinkedIn, Facebook, and most other platforms support square uploads, so you can syndicate your post without cropping out content. Square videos also take up more vertical space in the feed than landscape, 9:16 videos. The extra padding above and below makes space for captions and an embedded title. In this article, I’ll show you how to use Kapwing’s Studio to make square videos, GIFs, and images. Adding a caption above and below an image has become the most popular meme format in recent years. Instead of adding a text box to an image directly, meme makers add the caption above the image in a black or white rectangle. Memes with writing above are popular on Instagram, Reddit, Twitter, and Facebook. In this article, I’ll show you how to make a meme with writing above the picture. This tutorial uses a free website called the Kapwing, the most popular online meme maker for videos. 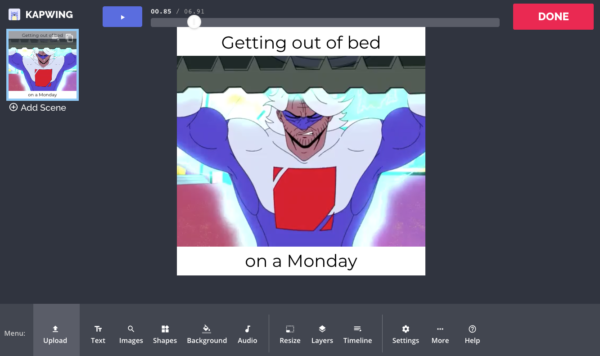 Kapwing’s Studio is a tool for adding text, making collages, and designing layouts for photos, videos, and GIFs. Kapwing’s Resizer is a free website to help you optimize images and graphics for Pinterest. It works on both mobile and desktop and allows you to take an existing graphic and make it work on Pinterest. In this article, I’ll show you how to use the Kapwing Resizer to resize images and video online. Instagram has a maximum aspect ratio of 4:5 on portrait posts (four pixels wide for every five pixels tall). Instagram’s restriction reduces the number of very tall images that take up a lot of vertical space in the feed. Although it’s nice that Instagram keeps users from publishing massive, obtrusive posts, the 4:5 limit makes it difficult to post a whole vertical picture or video that you shot on your phone. In this article, I’ll show you how to add a title to your video in less than 5 minutes. Kapwing’s Studio helps creators animate text in with a fade, flicker, and original library of text transitions. In this article, I’ll describe how to animate text in the Studio for creators looking to add flair. Pictures are meant to capture a moment, but moments are more complex than a freeze frame of time. In this article I’ll show you 3 different and unique techniques for changing your still photo into an image that moves. These techniques are all doable for free online with no download required.